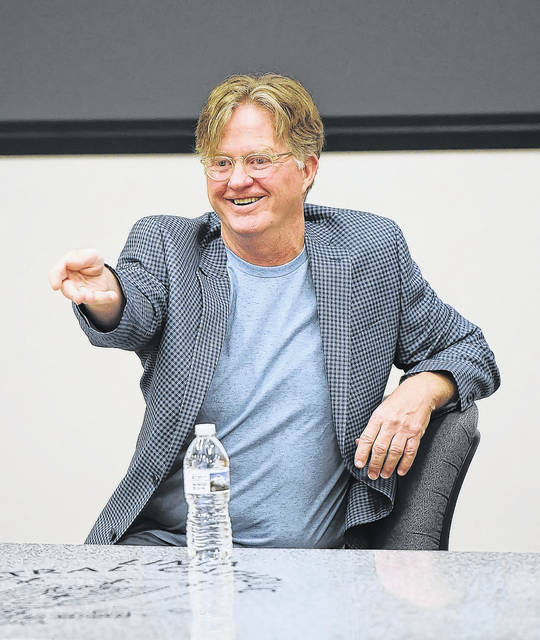 Lima native Tom Flynn, screenwriter and LCC Hall of Fame member, speaks during a a master class at Lima Central Catholic on Thursday. See more photos from Tom Flynn’s visit. 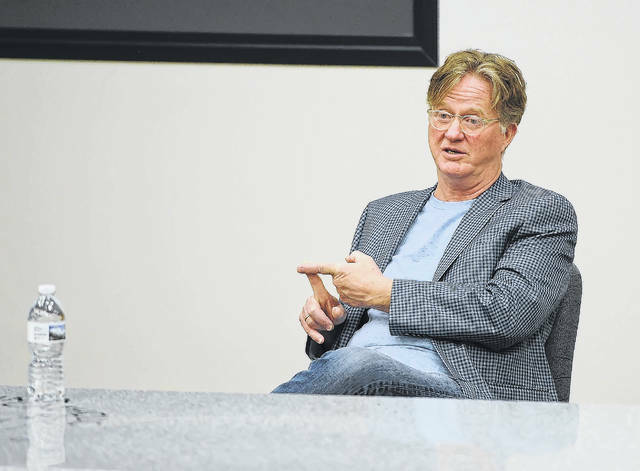 LIMA — Tom Flynn, a 1973 Graduate of Lima Central Catholic High School and a member of its Hall of Fame, returned to Lima to help raise money for the Lima Central Catholic Educational Foundation. “I haven’t been here in 45 years. This place is nuts. It’s fantastic what they’ve done. It’s beautiful. The gym is beautiful. The auditorium room I spoke at today was fantastic and this is more like a college campus,” he said. 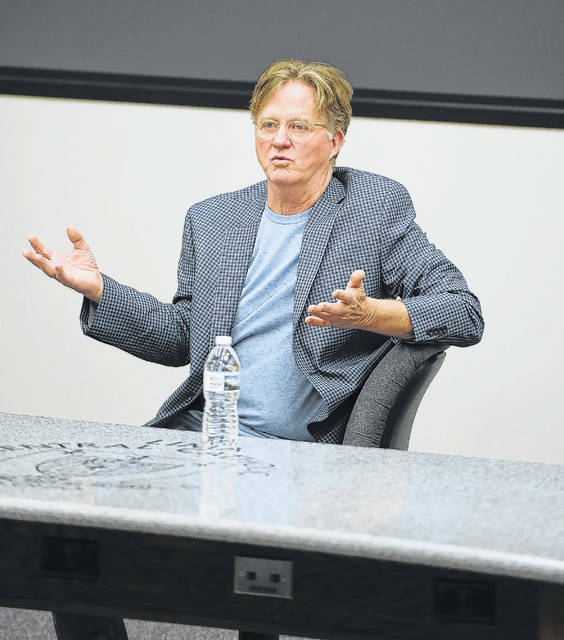 Flynn, who was the screenwriter for “Gifted,” which came out last year, talked to LCC students in a master class. “Forget about the end result and concentrate on character and story and if they want to do motion pictures then they have to start thinking about moments, about movie moments because that’s why people go. That’s why people talk about it when you leave, it’s about the individual moments where somebody goes ‘Wow they did this, wow they said this, wow this was funny, wow that was so sad’ so I said put that first,” he said. So, in this age of superhero movies, how does a movie like “Gifted” get made? “I had Captain America [actor Chris Evans] in it, that’s how,” he said, laughing. Gifted was a change for him professionally. “An overused term is ‘labor of love’ but that’s exactly what it was,” he said. Flynn actually retired before “Gifted” but felt the itch to start writing again. “I quit. I took my [Screen Actors] Guild pension. We were living in Florida and I kept threatening, you know, after writing 23 comedies, I kept threatening to my wife to write a drama and I must have said it one too many times because she said ‘Say it one more time, and if you don’t do it afterwards I’m going to hit you with a frying pan.’ My wife follows through on threats so I went and wrote the movie,” he said. “It was at my sister Pat’s winter place, a winter beach house, so there was nothing. Nothing was open. There’s nothing to do, so you write all day for five weeks,” he said. So what is next for Flynn? “Disney is saying, ‘It’s not official yet, it’s not been green-lit by the president,’ but they are scouting locations. They’ve hired a director and I think they’re going to make my movie ‘Togo,’ which is an adventure movie set in Alaska in 1925. There’s been a long, bad telling of this story of what really happened and this is going to be the true story of the diphtheria epidemic in Nome, Alaska, in 1925. It’s a fantastic story,” he added. “I finished it this afternoon, on the way over here. In LCC, the last two lines that my director wanted changed, I changed. We’re giving it to the studio tomorrow,” he stated.